Cambridge Activity Books, Second Edition, is a set of three graded books for preschool learners, aimed at honing a range of skills and preparing them for their primary education years. This edition comes with a new look that children would find appealing. It contains additional components to further enrich the learning process. The focus of Cambridge Activity Books, Second Edition, is to stimulate the learners’ linguistic and cognitive skills and development of various associated skills of observation, comparison, motor-mechanic and higher order thinking skills. The series is well-equipped with new teacher-specific elements and concepts integrated with life skills and value education. 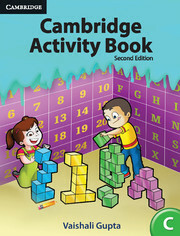 This book covers Colours, Shapes and Patterns, English, Me and My Body, My Surroundings, Animals Around Me and Numbers. Warm up activities to arouse the learner’s interest in the topics covered in each unit before actual teaching and learning. Sticker activities to hone cognitive skills. Colourful pictures to make learning enjoyable. Extended Learning to provide additional Information and ideas pertaining to a topic. Value Education to sensitise learners to various moral and ethical issues. Life Skills to create awareness of various issues and encourage responsible behaviour. Revision Worksheets to provide additional exercises/activities for revising a topic. More Worksheets to highlight the availability of web resources. Key Skills to give an overview of the variety of skills honed in each unit. Teacher tips to give suggestions for effective classroom teaching.